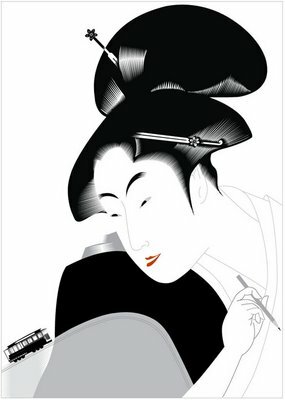 Geisha coming on. Almost done. Working on a Diana Ross distill for Jean and Nancy Stahl...with the distill to see where I can take this image. Tracing on the computer pretty fast...and its beginning to look like the first step. Its fun though. I think the summer of portraits is really great. It will be a good idea to see where this can go. 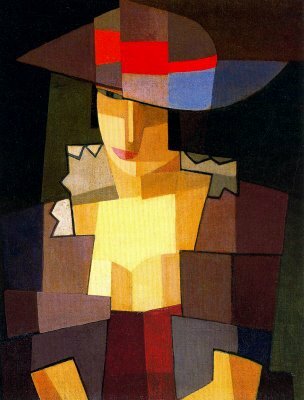 "Emilio Pettoruti was an Argentine painter, who caused a scandal with his avant-garde cubist exhibition in 1924 in Buenos Aires. At the beginning of the twentieth century, Buenos Aires was a city full of artistic development. 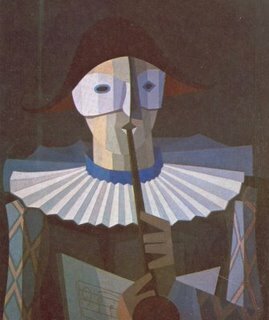 Pettoruti's career was thriving during the 1920s when "Argentina witnessed a decade of dynamic artistic activity; it was an era of euphoria, a time when the definition of modernity was developed." Previously, he had been awarded, in 1912, a traveling scholarship to Italy, where he met the Futurist artists, and also exhibited at Herwarth Walden's "Der Sturm Gallery" in Berlin. 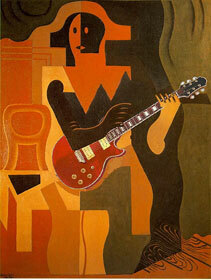 In Paris, he met Juan Gris, who influenced him to paint in a cubist style. While Pettoruti was influenced by cubism, futurism, constructivism, and abstraction, he did not claim to paint in any of those styles in particular. Exhibiting all over Europe and Argentina, Emilio Pettoruti is remembered as one of the most influential artists in Argentina in the 20th century for his unique style and vision." I love this. Mr. Lopato lives in a world I know nothing about...Nothing. There are a rich vein of illustrators and artists from South America that we know nothing of. I want to chase down his other influences and see what there is so see. I love the color and the more obvious cubism that Pettoruci shows...breaking the image down to basics but keeping it a bit more decorative than Juan Gris and Braque (poor, drab Braque). Picasso keeps his humor in his cubist work...using shape and line in a way that I would like to better understand. Hmmm. Gotta go. There are 17 packages of postcards going to my Hartford class for promotional cards for our show and 3 boxes to go filled with programs and pencils. Wrapping this up. Now, I wonder where my output is? Peter H. is almost done with the lovely editing he is doing to the masterwork paper (not)...and very sweet about how fun it has been to do! And, need to get on fixing the octopus. Have put a bit of time into it...but have been lured by the siren of our geisha girl and now Diana Ross. Bad Girls!